Rallyru had the most liked content! 1980 GL Wagon "My quest for something different"
The 5 speed dual range holds up just fine with a transfercase behind it. I almost never need to use the transmission low range anyways but it’s nice to have. An ej22 will do just fine. I have an ej25d and have never felt like I need more power. An EZ would probably break the samurai transfercase. They crack easily with high torque and/or high power. The Ford 8.8 is another rear diff option. Factory they are 59.5” but can be narrowed down to 56.5”ish with factory parts. Don’t really know what to do about the front. The best transfercase to use is the samurai as it has high range reduction and aftermarket support like gearing, shifters, driveline disconnects, and parking brakes. It also tucks up the highest. But the Nissan cases are easier to install as the outputs line up and the flanges are the same as Subarus. I researched transfercase swaps for about 6 months before I did mine. It’s been done for over a year and I think I’m still the most recent person to do it in an old Subaru (There’s a Foz in Australia on solid axles that’s fairly recent). I’ve also taken the most pics (to my knowledge). I used an old piece of mustache bar and welded it to the stock crossmember to support the front. For the rear I built a crossmember that bolts to the radious rod blocks and welded the stock mount to that. You can see the crossmember I built in the pic below before I welded the diff mount to it. I built my own crossmember to hold the engine. It won’t fit with a 4 inch lift. 6 is minimum but 8 is better. I have a samurai transfercase but Nissan 720 is the most common to swap in. In theory it’s really simple. Transmission in permanent 4wd to transfercase to diffs. Requires a minimum 6 inch lift and at that height you should already have the lift blocks connected so you build the mounts off of that. I put a transfercase in my ea81. The pajero snorkel fits the MY with a little heat. I have one on mine. The more I think about it, the more I want to build another lifted Subaru. I thought about using my Subaru to build it but I’d hate to strip out everything I’ve worked so hard to build just to start again. It’s actually easier to just start with a fresh car. So the build plans are: -GL hatchback -40-44 inch tires -Currie Fabricated Ford 9inch front and rear -LS with 400-600hp -Built 4L80e -Atlas 4 speed transfercase I know it sounds crazy and most wont like it because “It’s not Subaru” but that’s kinda the point. I just want to build it to be bulletproof. It’s only money, right? If nobody buys my car and I get tired of looking for a hatch I’ll use my wagon. I’ve even been playing with the idea of shortening my wagon into a hatch but it would take a lot of metal work to make it look decent. Either way it will be a lot of work. 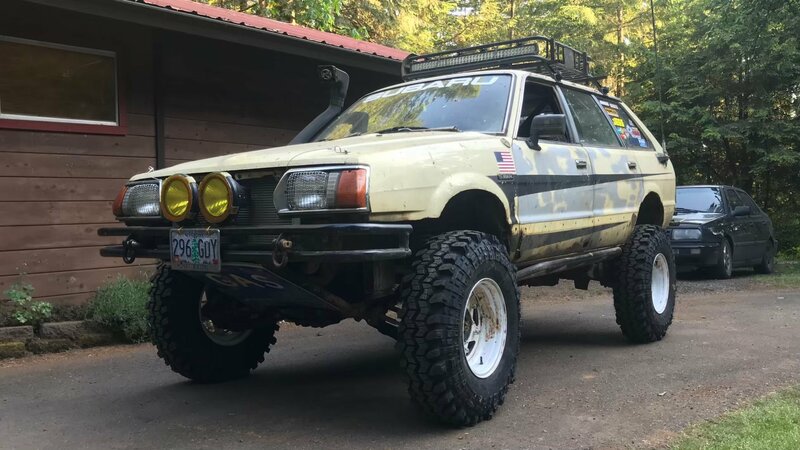 With that being said, anybody in the PNW have a Hatch for sale? The closer to St. Helens, OR the better haha. Decided to list my Subaru for sale. It’s been fun but I need the money for my rx7 and upcoming bills. I’ll build another though.